F Malte Strömvall (Tri-City, 2011-13) has been released by the Växjö Lakers (Sweden, SHL) by mutual agreement. He had two goals in 21 games. . . .
D Frantisek Mrazek (Red Deer, 1997-99) has signed a contract through Dec. 15 with Weiden (Germany, Oberliga) after a successful tryout. He had three goals and two assists in four games. The Vancouver Giants fired head coach Troy Ward on Wednesday, just four months after they had signed him to a three-year contract. Ward was signed to a three-year contract on July 17 to replace Don Hay, who had spent the previous 10 seasons as the Giants’ head coach. Hay returned to Kamloops where he now is head coach of the Blazers. The Giants were 9-16-0 and last in the B.C. Division under Ward, who spent the previous three seasons as head coach of the Abbotsford Heat, the AHL affiliate of the NHL’s Calgary Flames. Calgary moved the Heat to Glens Falls, N.Y., over the summer, but chose not to re-sign Ward. Matt Erhart, the Giants’ lead assistant coach, now is interim head coach, with Ian Gallagher, the club’s strength and conditioning coach, and skills coach Yogi Svejkovsky his assistants. The Giants, who began an Alberta swing with a 6-1 loss to the Medicine Hat Tigers on Tuesday, dropped a 4-0 decision to the Hurricanes in Lethbridge last night. Bonner is on the road with the Giants. Ward is the second coaching casualty of this season. The Prince Albert Raiders fired Cory Clouston on Oct. 31 and replaced him with Marc Habscheid. Over the summer, 10 WHL teams hired new head coaches. The junior B Grand Forks Border Bruins of the Kootenay International Junior Hockey League have fired Brad Snyder, their general manager and head coach. The Border Bruins went into Tuesday in fifth place in the five-team Neil Murdoch Division, with a 7-15-1-2 record and five straight losses. . . . Snyder was in his first season in Grand Forks, having been hired on May 12. . . . Darryl Olsen, who is from Grand Forks, now is handling the coaching duties. The SJHL’s Battlefords North Stars have signed general manager and head coach Kevin Hasselberg to a two-year extension that runs through 2016-17. . . . Hasselberg is in his fourth season with the North Stars, who are 15-5-5-0. In the three-plus seasons under Hasselberg, the North Stars are 118-58-7-10. F Kyle O’Connor, 18, announced his retirement from the Kootenay Ice on Wednesday. According to the Ice, O’Connor “has retired from hockey in order to pursue educational opportunities.” . . . O’Connor, from Calgary, was a fourth-round pick in the 2011 bantam draft. . . . He had 22 points, including 10 goals, in 132 games over three seasons. This season, he had a goal and an assist in 20 games. . . . Taylor Rocca of the Cranbrook Daily Townsman has more right here. The Brandon Wheat Kings and Saskatoon Blades did something of a goatending dance on Wednesday. The Blades dealt G Alex Moodie to the Wheat Kings for a conditional eighth-round pick in the 2015 WHL bantam draft. . . . The draft pick is conditional on Moodie being on the Wheat Kings’ roster on Jan. 10. . . . The Wheat Kings then released G Logan Thompson, 17, from their roster and are looking for a place for him to play. Thompson is from Calgary. . . Moodie, a 19-year-old Winnipegger, was a fifth-round selection by the Blades in the 2010 bantam draft. In Brandon, he will play alongside Jordan Papirny, 18. Moodie, who practised with the Wheat Kings yesterday, should be in Brandon’s lineup on Friday night when it plays in Saskatoon. . . . This is the second time this season that Moodie has been traded by the Blades. Earlier, he was dealt to the Spokane Chiefs, who later returned him to Saskatoon. . . . The Blades have settled on Nik Amundrud, 17, and Trevor Martin, 18, as their goaltenders, at least for now. D Anea Ferrario, a 16-year-old from Ogden, Utah, has committed to Brown University. He was a seventh-round selection by the Tri-City Americans in the 2013 WHL bantam draft. He is playing this season for the Victory Honda U16 team. . . .
F Kris Schmidli of the Kelowna Rockets will play for Switzerland at the World Junior Championship that runs Dec. 26 through Jan. 5 in Toronto and Montreal. Schmidli, an 18-year-old sophomore, has 17 points, including five goals, in 26 games this season. In Saskatoon, the Moose Jaw Warriors scored the game’s first three goals and hung on for a 4-2 victory over the Blades. . . . F Tanner Jeannot’s first goal gave the Warriors a 3-0 lead at 4:58 of the third period. . . . The Blades then got PP goals form F Brett Stovin, his fifth, at 9:19, and F Ryan Graham, his seventh, at 14:10. . . . Warriors F Jaimen Yakubowski put it away with an empty-netter at 19:47. . . . Moose Jaw got PP goals from both its big guns, with F Brayden Point getting his 14th goal and F Jack Rodewald getting No. 13. Point has six goals in three games against Moose Jaw this season. . . . Warriors D Alexey Steptsov had two assists. . . . The Warriors are 11-12-3, while the Blades are 7-17-1. . . . Prior to the game, the Warriors brought in D Josh Brook from the midget AAA Notre Dame Hounds. Brook, the fourth overall pick in the 2014 bantam draft, had 10 points, three of them goals, in 11 games with the Hounds. He’s from Roblin, Man. . . . In Calgary, the Prince Albert Raiders ran their winning streak to five games with a 2-1 victory over the Hitmen. . . . Raiders F Gage Quinney broke a 1-1 tie with his fourth goal at 16:52 of the second period, via the PP. . . . F Reid Gardiner scored his 14th goal at 17:57 of the first. . . . Calgary D Travis Sanheim scored his ninth, on a PP, at 8:18 of the second. . . . Prince Albert G Rylan Parenteau stopped 17 shots, two fewer than Calgary’s Evan Johnson. . . . Raiders D Josh Morrissey and D Hunter Warner each had two assists. . . . The Raiders reached .500 at 13-13-0, while the Hitmen slipped to 13-10-3. . . . In Edmonton, the Oil Kings scored 10 seconds into the first period and went on to beat the Swift Current Broncos, 4-1. . . . Edmonton F Brett Pollock scored his13th goal to get the home team rolling. . . . Edmonton G Patrick Dea, making his third straight start with Tristan Jarry battling an illness, stopped 31 shots as the Oil Kings (13-10-4) halted a three-game losing skid (0-2-1). . . . F Cole Benson and D Dysin Mayo each had a goal and an assist for Edmonton. Each has six goals. . . . Mayo also was plus-4. . . . The Broncos are 14-10-4. . . . They got their lone goal from F Colby Cave, his 11th, at 17:56 of the third. . . . In Lethbridge, G Stuart Skinner stopped 37 shots to lead the Hurricanes to a 4-0 victory over the Vancouver Giants. . . . The Hurricanes (6-15-4) had lost their previous nine games (0-6-3). . . . The Giants (9-17-0) have lost five in a row. . . . Skinner, a 16-year-old from Edmonton, recorded his first WHL shutout. He hadn’t played for the Hurricanes since Oct. 26. 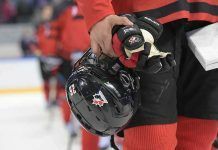 He played in the U-17 World Hockey Challenge and then suffered an undisclosed injury during a practice upon his return. . . . Lethbridge F Riley Sheen had four assists, while F Jamal Watson scored twice, the first one coming a minute into the game. He’s got 12 goals. . . . In Prince George, F Morgan Klimchuk scored twice to help the Regina Pats to a 5-2 victory over the Cougars. . . . Klimchuk has eight goals. . . . The Pats (14-10-1) are 1-1-0 on their B.C. Division tour. . . . Regina led 3-0 when F Connor Gay scored his 10th goal at 7:01 of the second period. . . . F Dryden Hunt and F Sam Steel each had two assists for Regina. . . . The Cougars (13-14-0) got to within 3-1 and 4-2 but never any closer. . . . Regina G Daniel Wapple stopped 30 shots. . . . Prince George F Jari Erricson took a cross-checking major and game misconduct at 18:56 of the third period. . . . In Kennewick, Wash., F Rourke Chartier, the WHL’s leading sniper, scored twice as the Kelowna Rockets dumped the Tri-City Americans, 4-1. . . . Chartier leads the WHL in goals (28) and points (47). . . . Linemate Nick Merkley, who has 46 points, had one assist. . . . Chartier’s second goal, 19 seconds into the third period, broke a 1-1 tie. . . . Chartier has 17 goals in 13 games this month. . . . Kelowna F Tyson Baillie scored his 19th goal to stretch the lead to 3-1 at 9:38. . . . Kelowna G Jackson Whistler stopped 26 shots, four fewer than Tri-City’s Eric Comrie. . . . The Rockets now are 22-2-3, while the Americans are 14-11-0 and have lost two in a row. . . . In Spokane, F Kailer Yamamoto and F Calder Brooks each had three points as the Chiefs doubled the Victoria Royals, 4-2. . . . Brooks scored twice, giving him 10, and added an assist; Yamamoto drew three assists. . . . Spokane D Jason Fram broke a 1-1 tie with his third goal at 15:03 of the second period and F Adam Helewka added insurance with his 13th goal at 19:04. . . . F Greg Chase scored his second goal in as many games for the Royals, while F Austin Carroll added his 18th. . . . The Chiefs (13-7-3) have won four straight and moved into second in the U.S. Division, a point ahead of Tri-City. . . . The Royals (14-13-2) have lost two in a row. . . . In Everett, the Silvertips scored two first-period goals en route to a 2-1 victory over the Kamloops Blazers. . . . F Carson Stadnyk got his 11th goal at 5:51 and F Brayden Low scored No. 7 at 9:41, on a PP, as Everett took a 2-0 lead. . . . F Collin Shirley, with his sixth, got the Blazers on the board with a PP goal at 10:01 of the second. . . . Everett G Austin Lotz turned aside 22 shots. . . . Kamloops G Connor Ingram, making his fifth straight start, stopped 25 shots. . . . This was the final meeting of the regular season between these teams; the Silvertips went 4-0-0 and now have beaten the Blazers eight straight times. . . . WHL Facts tweeted that Lotz was 1.22/.957 in the four games with Kamloops this season. . . . The Silvertips (16-4-3) have won two in a row. . . . Kamloops (11-11-5) had been 2-0-2 in its previous four.